There may be some interest in an inexpensive watch I use that was originally intended for use by the blind. 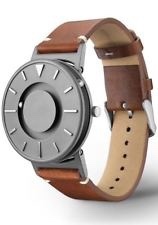 It is called the Eone Bradley Timepiece. 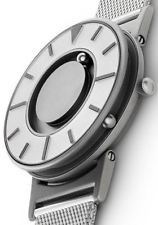 It has a titanium body and utilizes two captured ball bearings as a substitute for the conventional clock hands. But I wouldn't describe it as inexpensive. That does qualify as titanium jewelry ... very cool! A clarification regarding price. About $150 and up on eBay (less 15% if you wait eBay out on one of their code word for the day sales, which I like to do) and about $250 and up on Amazon. Yeah, Amazon should be avoided if possible. I while back I bought a Shure SM57 on Ebay, but it was a fake, so I got a refund and bought a genuine one from one of Shure's recommended stockists. Then someone recommended a pair of Neumann mics. Cheapest on Amazon was £1,700 the pair, so I bookmarked them, in order to look again when I had won the Lotto. Then a while later, I wondered if my Shure-recommended stockist sold them. Yep, £1,000 the pair! It will still need a Lotto win, but the price difference is interesting. For books and CDs, I check both sites since it can go either way. Amazon has a more sophisticated computer system IMO. I like to purchase Knilling pegs from the Amazon Warehouse deals. I found that once you put them in your cart, the price never continues down. I check both sites since it can go either way. Absolutely - people always tell me to use Abebooks, but I find Amazon comes up trumps about 10 times as often as Abebooks.